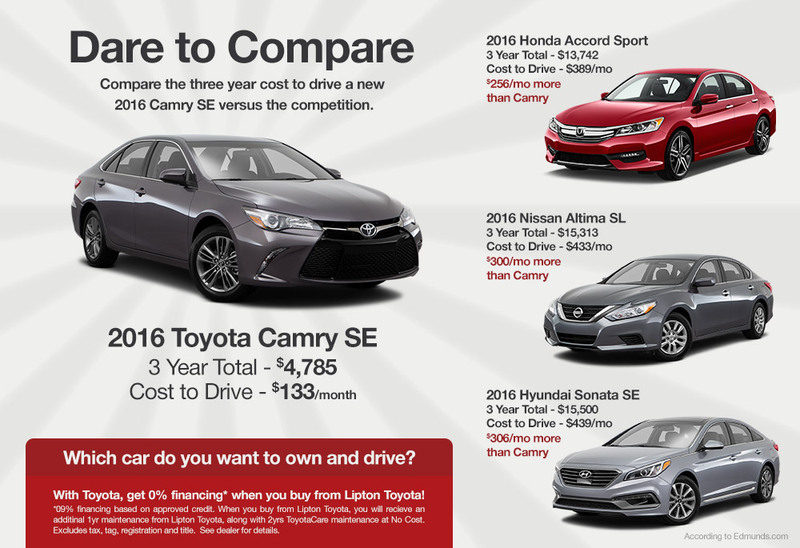 Wondering what it really costs to drive a new Toyota Camry and some of today's other popular models? We're not afraid to show you! In case you hadn't heard, Lipton Toyota is known for its excellent service and reliability. How do we do it? Our employees, our facilities all play a role, but we also have new Toyota products that make customers (and their wallets) fall in love. Cars like the 2016 Toyota Camry SE. This sportier version of one of the most popular cars in America comes standard with 17-inch alloy wheels, a sport-tuned suspension, air conditioning, a 6-speed automatic transmission and automatic headlights. Factor in its impressive 25/35 MPG fuel economy and you have a car that stacks up fairly well against other in-class competitors. And that's before you get to the all-important bottom line. When you start considering all of the costs associated with driving off the lot in a new car, that's when the 2016 Toyota Camry really starts to shine. Edmunds' True Cost to Own® calculates all of these additional costs--including fuel, insurance, depreciation, maintenance, repairs, taxes, fees and financing--to provide accurate information regarding what you can expect to pay over the first five years. Our beloved Camry checks in with a tidy three year total of $4,785, or $133/month. That's significantly more affordable than the Honda Accord ($13,742 or $389/month), Nissan Altima ($15,313 or $433/month) and Hyundai Sonata ($15,500 or $439/month). Toyota has earned a reputation for building reliable cars that maintain their value over time. Plus, you can get 0% financing and when you buy from Lipton Toyota, you will receive an additional 1yr maintenance from Lipton Toyota, along with 2yrs ToyotaCare maintenance at No Cost. So, after taking this all in and crunching the data, we feel fairly confident that you'll reach the same conclusion that many drivers in the Ft. Lauderdale area already have: it's time to take a hard look at the 2016 Toyota Camry at Lipton Toyota in Fort Lauderdale.